This declining tree was positive for Cherry leaf roll virus, Prune dwarf virus and Prunus necrotic ringspot virus. Note the stump on the left side of this image. These trees look normal in 2013 but were in decline or dead by 2016. Ornamental cherry with possible American plum line pattern virus. Note that the chlorosis on some of the leaves is on the veins and not between the veins. Other leaves have oak leaf-like line patterns. Cause One of the causes of virus-induced decline of sweet cherry trees is Cherry leafroll virus. 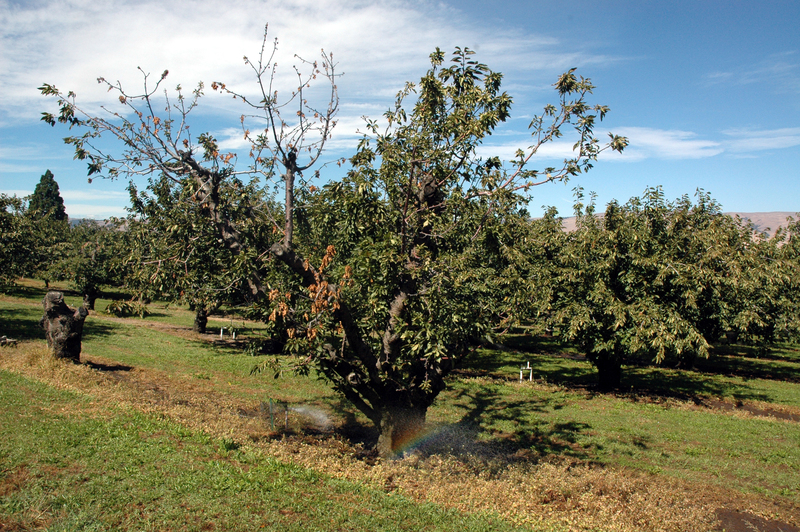 The symptoms become much more severe when the infection is in combination with Prune dwarf virus, Prunus necrotic ringspot virus or American plum line pattern virus. Although Cherry leafroll virus belongs to a group of viruses that are nematode transmitted, there are no known nematode vectors present in the Pacific Northwest. How it is transmitted is unknown but evidence points to root grafts. The disease has spread more rapidly than expected in the Yakima Valley of WA and is now found with increasing frequency in all cherry production areas of eastern WA. Many infected trees have been removed. The disease was first found in Oregon in 2016. 'Bing' scion infection resulted in a hypersensitive reaction of 'Colt' or 'Gisela 6' rootstocks killing the tree. Symptoms Alone, Cherry leafroll virus causes delayed flowering. Virus infection promotes a heavy set of fruit that matures late and ripens poorly yielding small, light-color fruit, which often is unmarketable. Also, an early leaf drop begins just after bloom, leaving the tree with a sparse, open canopy. Young shoots tend to die back over winter, and many buds fail to develop, leaving blind wood. In combination with Prune dwarf virus, leaves develop enations along the midrib resembling rugose disease, and the fruit symptoms increase. 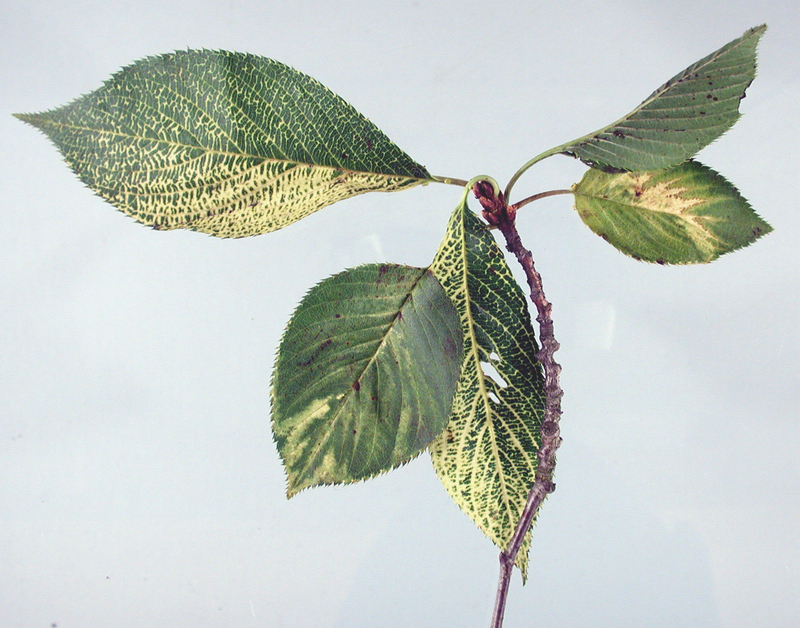 With Prunus necrotic ringspot virus and American plum line pattern virus, the tree's decline is accelerated. Dieback of young growth and blind wood weakens the trees rapidly. In combination with midsummer defoliation, the trees are severely weakened and die within 3 to 5 years. Use only planting material certified as virus-tested and found to be free of all known viruses. Prevent secondary spread via root grafts by using a resistant/tolerant rootstock such as 'Colt' or 'Krymsk 5'. Rogue infected trees as soon as possible. First, have the tree positively identified as infected with the virus. Next, apply a general insecticide to kill possible insect or mite vectors. Remove the tree at the ground line. Treat the trunk with herbicide to kill the roots (sucker sprouts would still be infected). Some herbicide damage may be observed in adjacent trees due to root grafts. Reference Eastwell, K.C. and Howell, W.E. 2010. Characterization of Cherry leafroll virus in sweet cherry in Washington state. Plant Disease. 94:1067. Lutes, L.A. and Pscheidt, J.W. 2018. First Report of Cherry leaf roll virus on Sweet Cherry in Oregon. Plant Disease 102:691.